Hindu God Ganesha Statue is the Lord of success and destroyer of evils and obstacles.Lord Ganesha Statue is known to Bring prosperity and happiness in your home & Office. Lakshmi is the Hindu goddess of wealth, fortune, and prosperity (both material and spiritual), as well as the embodiment of beauty. Lakshmi name is derived from Sanskrit root words for knowing the goal and understanding the objective. Saraswati (Sanskrit: , Sarasvat ) is the hindu goddess of knowledge, music, arts and science. 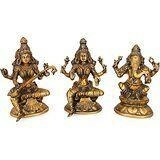 She is the companion of Brahma, also revered as his Shakti (power). It was with her knowledge, that Brahma created the universe. She is a part of trinity "Saraswati", "Lakshmi" and "Parvati". Size : 7.5 Inches Height X 5.2 Inches wide X 3 Inches depth. Weight : 5.1 Kg Material : Brass..-------------- Pls beware from Copy product & ensure buying authentic product. This is exclusive inhouse design & product of Brand "Collectible India" and "covered by intellectual property rights laws". 'Collectible India' doesn t authorize any other Brand/Seller to sell it and we won't be responsible if any counterfeit or substandard product send by any other seller.